For other uses, see Datura (disambiguation). For other Devil's Trumpet, see Datura (disambiguation). Datura is a genus of nine species of poisonous vespertine flowering plants belonging to the family Solanaceae. They are commonly known as daturas, but also known as devil's trumpets, not to be confused with angel's trumpets, its closely related genus Brugmansia. 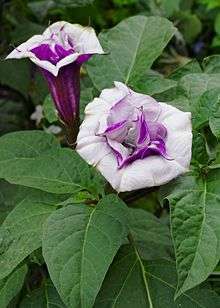 They are also sometimes called moonflowers, Jimsonweed, devil's weed, hell's bells, thorn-apple, and many more. Its precise and natural distribution is uncertain, owing to its extensive cultivation and naturalization throughout the temperate and tropical regions of the globe. Its distribution within the Americas and North Africa, however, is most likely restricted to the United States and Mexico and Southern Canada in North America, and Tunisia in Africa, where the highest species diversity occurs. All species of Datura are poisonous, especially their seeds and flowers. Some South American plants formerly thought of as Datura are now treated as belonging to the distinct genus Brugmansia (Brugmansia differs from Datura in that it is woody, making shrubs or small trees, and it has pendulous flowers, rather than erect ones). Other related taxa include Hyosyamus niger, Atropa belladonna, Mandragora officinarum, and many more. The name Datura is taken from Hindi धतूरा dhatūra 'thorn-apple', ultimately from Sanskrit धत्तूर dhattūra 'white thorn-apple'. In the Ayurvedic text Sushruta different species of Datura are also referred to as kanaka and unmatta. Record of this name in English dates back to 1662. Nathaniel Hawthorne refers to one type in The Scarlet Letter as apple-Peru. In Mexico, its common name is toloache. Datura belongs to the classic "witches' weeds", along with deadly nightshade, henbane, and mandrake. Most parts of the plants are toxic, and datura has a long history of use for causing delirious states and death. It was well known as an essential ingredient of potions and witches' brews. In India it has been referred to as "Poisonous" and as an aphrodisiac. In little measures it was used in Ayurveda as a medicine from the ancient times. It is used in rituals and prayers to Shiva. The larvae of some Lepidoptera (butterfly and moth) species, including Hypercompe indecisa, eat some Datura species. It is difficult to classify Datura as to its species, and it often happens that the descriptions of new species are accepted prematurely. Later, these "new species" are found to be simply varieties that have evolved due to conditions at a specific location. They usually disappear in a few years. Contributing to the confusion is the fact that various species, such as D. wrightii and D. inoxia, are very similar in appearance, and the variation within a species can be extreme. For example, Datura species can change size of plant, leaf, and flowers, all depending on location. The same species, when growing in a half-shady, damp location can develop into a flowering bush half as tall as an adult human of average height, but when growing in a very dry location, will only grow into a thin plant not much more than ankle-high, with tiny flowers and a few miniature leaves. American Brugmansia and Datura Society, Inc. (ABADS) is designated in the 2004 edition of the International Code of Nomenclature for Cultivated Plants as the official International Cultivar Registration Authority for Datura. This role was delegated to ABADS by the International Society for Horticultural Science in 2002. Datura species are usually planted annually from the seed produced in the spiny pods, but with care, plants can be overwintered. Most species are suited to being planted outside or in containers. As a rule, they need warm, sunny places and soil that will keep their roots dry. When grown outdoors in good locations, the plants tend to reseed themselves and may become invasive. In containers, they should have porous, aerated potting soil with adequate drainage. The plants are susceptible to fungi in the root area, so anaerobic organic enrichment such as anaerobically composted organic matter or manure, should be avoided. All Datura plants contain tropane alkaloids such as scopolamine, hyoscyamine, and atropine, primarily in their seeds and flowers. Because of the presence of these substances, Datura has been used for centuries in some cultures as a poison. There can be a 5:1 toxin variation between plants, and a given plant's toxicity depends on its age, where it is growing, and the local weather conditions. These variations makes Datura exceptionally hazardous as a drug. In traditional cultures, a great deal of experience with and detailed knowledge of Datura was critical to minimize harm. Many tragic incidents result from modern users ingesting Datura. 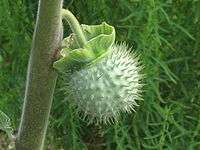 For example, in the 1990s and 2000s, the United States media contained stories of adolescents and young adults dying or becoming seriously ill from intentionally ingesting Datura. There are also several reports in the medical literature of deaths from D. stramonium and D. ferox intoxication. Children are especially vulnerable to atropine poisoning. Datura toxins may be ingested accidentally by consumption of honey produced by several wasp species, including Brachygastra lecheguana, during the Datura blooming season. It appears that these semi-domesticated honey wasps collect Datura nectar for honey production which can lead to poisoning. In some parts of Europe and India, Datura has been a popular poison for suicide and murder. From 1950 to 1965, the State Chemical Laboratories in Agra, India, investigated 2,778 deaths caused by ingesting Datura. The US Centers for Disease Control and Prevention reported accidental poisoning resulting in hospitalization for a family of six who inadvertently ingested Datura used as an ingredient in stew. In some places, it is prohibited to buy, sell, or cultivate Datura plants. Due to the potent combination of anticholinergic substances it contains, Datura intoxication typically produces effects similar to that of an anticholinergic delirium (usually involving a complete inability to differentiate reality from fantasy); hyperthermia; tachycardia; bizarre, and possibly violent behavior; and severe mydriasis (dilated pupils) with resultant painful photophobia that can last several days. Pronounced amnesia is another commonly reported effect. In Pharmacology and Abuse of Cocaine, Amphetamines, Ecstasy and Related Designer Drugs, Freye asserts: Few substances have received as many severely negative recreational experience reports as has Datura. The overwhelming majority of those who describe their use of Datura find their experiences extremely unpleasant both mentally and often physically dangerous. 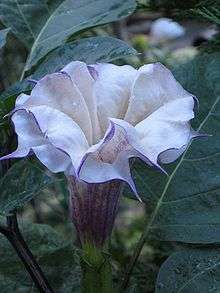 However, anthropologists have found that indigenous groups, with a great deal of experience with and detailed knowledge of Datura, have been known to use Datura recreationally (including the Navajo and especially the Havasupai). The knowledge of Datura's properties was critical to minimize harm. Due to their agitated behavior and confused mental state, victims of Datura poisoning are typically hospitalized. Stomach pumping and the administration of activated charcoal can be used to reduce the stomach's absorption of the ingested material. The drug physostigmine is used to reverse the effect of the poisons. Benzodiazepines can be given to curb the patient's agitation, and supportive care with oxygen, hydration, and symptomatic treatment is often provided. Observation of the patient is indicated until the symptoms resolve, usually from 24–36 hours after ingestion of the Datura. ↑ "Datura metel". plants.ces.ncsu.edu. Retrieved 2016-01-17. ↑ Lester, R. N.; Nee, M.; Estrada, N. (1991). Hawkes, J. G., ed. Solanaceae III – Taxonomy, Chemistry, Evolution (Proceedings of Third International Conference on Solanaceae). Kew: Royal Botanic Gardens. pp. 197–210. ISBN 0-947643-31-1. 1 2 Monier-Williams, Monier (1899). A Sanskrit-English dictionary : etymologically and philologically arranged with special reference to cognate Indo-European languages. Oxford: Clarendon Press. 1 2 3 4 5 6 7 8 9 10 Preissel, U.; Preissel, H.-G. (2002). Brugmansia and Datura: Angel's Trumpets and Thorn Apples. Buffalo, NY: Firefly Books. pp. 106–129. ISBN 1-55209-598-3. ↑ Adams, J. D. Jr.; Garcia, C. (2005). "Spirit, Mind and Body in Chumash Healing". Evidence-based Complementary and Alternative Medicine. 2 (4): 459–463. doi:10.1093/ecam/neh130. PMC 1297503 . PMID 16322802. ↑ Goetz, R.; Siegel, E.; Scaglione, J.; Belson, M.; Patel, M. (2003). "Suspected Moonflower Intoxication -- Ohio, 2002". MMWR Morbidity and Mortality Weekly Report. CDC. 52 (33): 788–791. PMID 12931077. ↑ Michalodimitrakis, M.; Koutselinis, A. (1984). "Discussion of "Datura stramonium: A fatal poisoning"". Journal of Forensic Sciences. 29 (4): 961–962. PMID 6502123. ↑ Boumba, V. A.; Mitselou, A.; Vougiouklakis, T. (2004). "Fatal poisoning from ingestion of Datura stramonium seeds". Veterinary and Human Toxicology. 46 (2): 81–82. PMID 15080209. ↑ Steenkamp, P. A.; Harding, N. M.; Van Heerden, F. R.; Van Wyk, B.-E. (2004). "Fatal Datura poisoning: Identification of atropine and scopolamine by high performance liquid chromatography / photodiode array / mass spectrometry". Forensic Science International. 145 (1): 31–39. doi:10.1016/j.forsciint.2004.03.011. PMID 15374592. ↑ Taha, S. A.; Mahdi, A. H. (1984). "Datura intoxication in Riyadh". Transactions of the Royal Society of Tropical Medicine and Hygiene. 78 (1): 134–135. doi:10.1016/0035-9203(84)90196-2. PMID 6710568. ↑ Djibo, A.; Bouzou, S. B. (2000). "[Acute intoxication with "sobi-lobi" (Datura). Four cases in Niger]". Bulletin de la Société de Pathologie Exotique (in French). 93 (4): 294–297. PMID 11204734. ↑ Bequaert, J.Q. (1932). “The Nearctic social wasps of the subfamily polybiinae (Hymenoptera; Vespidae)". Entomologica Americana. 13(3):87-150. 1 2 3 Andrews, Dale (2013-02-28). "Daturas". Crime Poisons. Washington: SleuthSayers. Retrieved 4 March 2013. ↑ Bontoyan, W.; et al. (2010-02-05). "Jimsonweed Poisoning Associated with a Homemade Stew – Maryland, 2008" (pdf). Centers for Disease Control and Prevention – Morbidity and Mortality Weekly Report. 59 (4): 102–103. Retrieved 2010-02-11. 1 2 Freye, E. (2010). "Toxicity of Datura Stramonium". Pharmacology and Abuse of Cocaine, Amphetamines, Ecstasy and Related Designer Drugs. Netherlands: Springer. pp. 217–218. doi:10.1007/978-90-481-2448-0_34. ISBN 978-90-481-2447-3. ↑ Fuller, Robert C (2000). Stairways to Heaven: Drugs in American Religious History. p. 32. ISBN 0813366127. ↑ Bliss, M. (2001). "Datura Plant Poisoning" (pdf). Clinical Toxicology Review. 23 (6). Rätsch, C. (2005) . The Encyclopedia of Psychoactive Plants. Rochester, VT: Park Street Press. ISBN 978-0-89281-978-2. Bliss, M. (2001). "Datura Plant Poisoning" (pdf). Clinical Toxicology Review. 23 (6). Roblot, F; Montaz, L; Delcoustal, M; Gaboriau, E; Chavagnat, JJ; Morichaud, G; Pourrat, O; Scepi, M; Patte, D (1995). "[Datura stramonium poisoning: the diagnosis is clinical, treatment is symptomatic].". La Revue de medecine interne / fondee ... par la Societe nationale francaise de medecine interne (in French). 16 (3): 187–90. doi:10.1016/0248-8663(96)80689-8. PMID 7740228. Krenzelok, Edward P. (February 2010). "Aspects of poisoning and treatment". Clinical Toxicology. 48 (2): 104–110. doi:10.3109/15563651003630672. PMID 20229618. Wikimedia Commons has media related to Datura. "PLANTS Profile: Datura L.". USDA Natural Resources Conservation Service. "GRIN Species Records of Datura". USDA Germplasm Resources Information Network (GRIN).